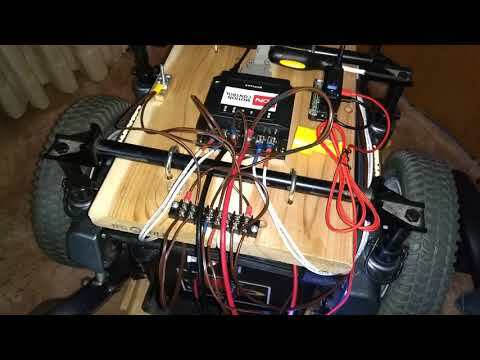 Disability Midwheel Drive Powerchair Conversion Project. This project is quite personal to me, My fiance has Multiple Sclerosis and is confined to a powerchair. She has stated several times, "I wish I could still mow the lawn, Shovel the porch, Sweep/Mop the floor, Vacuume the floor, and dust the house again", things we all take for granted. I am going to attempt to help her do all these things, mostly with items we have lying around the house or can obtain easily. Her current chair has 4 motors to control the chairs seat(full articulation), Upper half. these are all linear actuators with medical ratings. The lower half has 2 separate motors, the Base, to move about. This new char is not part of this project. She has two chairs, the old one is a "Quantum 6000z" power base. This old chair has a broken cable that attaches to the hand controller, the hand controller is also broken. 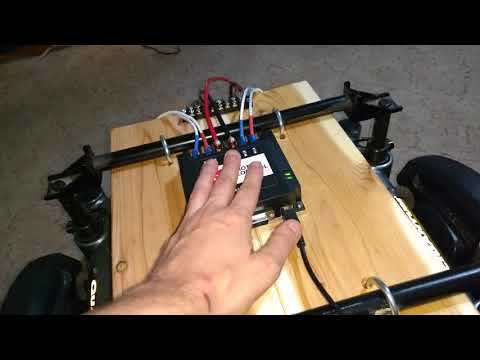 I have seen some people try to diagnose the signals that come from the hand controller to the main computer of the chairs and probe for signals to make their own hand controllers. There is little to no data on the signals and they are usually proprietary signals by the chair manufacturer. The drive wheels and motors will remain intact, however I would like to design a bolt on tracked system for outdoor use. Some power chairs drive axles have a 5 bolt pattern, others have 4 bolts. The four casters may need to be removed if you opt for a tracked system. Each attachment will have their own batteries, controllers, and charge units. Power inverters will be used for 110V power if the tool requires it (vaccume, snowblower, etc...). Each attachment will have a universal mechanism that will allow the Base to attach itself, lock, and go, this will be a type of cam lock system. A roller switch, maybe a few, will be used to detect placement of the base under the attachment and activate its locking mechanism. The cam style lock is of the type used in furniture and a small gear motor will activate the rotation of the cam to lock/unlock. The original motor controller/computer is a 100 Amp controller, which is more than double what is needed, even when the motors are in a stall condition. 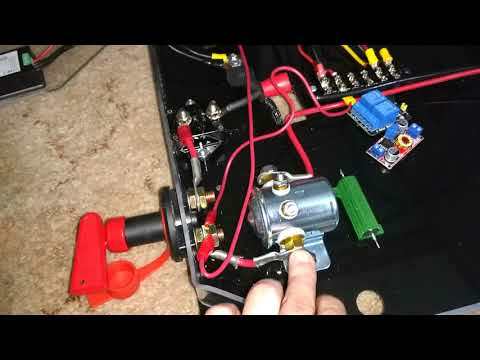 I will be using an Ion Motion Control MCP263 dual 60A 34VDC controller to drive the wheels for the base. All attachments will use various other ION Motion Controllers where a significant amount of weight will need to be pushed/lifted. The motors for the attachments will mostly be Linear Actuators which will be ordered from https://geek.wish.com as needed (significant wait times). They are mostly aluminum and may not be ideal for the purpose intended but they are fairly inexpensive and will be excellent to prototype with at low cost. On Monday November 13th 2017 I will purchase the main Base controller, and a 6 channel Radio transmitter/receiver pair. This thread will be updated once I receive the motor controller and have it attached to the motors. I will relay the information Ion Motion Control recommends for the type of motor break used on these motors since this will be done through email or over the phone. First step is to prepare the base for modification which can be done without any additional parts (see linked post). The first step is to prepare and clean the Power Base and remove everything we will not need, like the seat and original controller. I've taken photographs of tool free removal of the seat on this power chair, other chairs may have similar tool free maintenance options, others will not. Locate and activate the seat removal lever and squeeze hard, debris and dirt may make it dificult so you could use WD-40 and let it soak a few minutes to break it free. Remove the battery access cover, this is a simple lever on each side that just pushes toward the center to release the pins. Once the pins are released pull the metal of the footplate bracket straight up to remove it completely (Do not dispose of this cover it will be needed. Test the batteries in the same manner you would determine if an automotive batter is good, the batteries of my chair were way below 11 Volts they were 7 so they cannot be recovered fully. We will need Deep Cycle, Gell or similar high amp battery. Clean all removed parts and keep only the ones needed. The foot plate and screws, the seat and hand controller can be sold back to the Medical Supplier that sells and maintains these chairs, it will inevitable help keep these parts available to those that really need them. The battery access cover should be kept since it will be used. Locate and remove the original controller/computer, usually at the back of the base. Keep any brackets for our use but sell the hand controller cable and the original controller back to the Medical Supply companies. Keep battery and motor cables. The covers are usually tool free and have thumb screws, unscrew and remove all cover pieces, then unscrew and remove all cables/connectors to the controller. Edit: changed .org to .cc in all links as per instructions regarding dead links. I received the MCP263 motor controller a few weeks ago. ION Motion listed some part numbers in the manuals and I just placed the order today. It is not required, but I figured I better research the 4 pin motor connectors and the battery connectors so I can keep the original cabling and just store it aside, incase I want to put the chair back to the original condition. The power chair had two 73Amp batteries that were reading dead at about 3 volts, thankfully I was able to revive them. 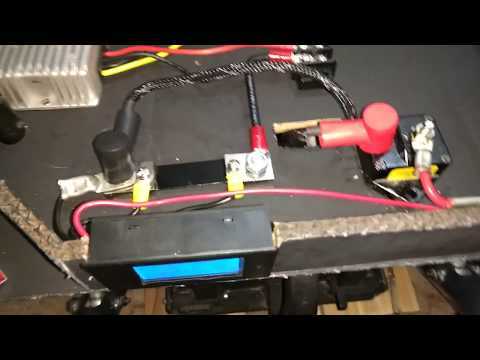 It took quite a long time to do this, I pulled a fully charged automotive battery out of the truck and put it in parallel on the battery charger with the 1 dead battery at a time. Took about 6 hours for the supposedly smart charger to charge the 73A Gell cell to a point where I could remove the good battery. After that it took 2 days to fully charge 1. The 4 pin connector of the motor is an "Anderson Power" "Power Pole" "15 to 45" connector (45 Amp contacts) with "Standard Housings", they offer what they call "Finger Proof" but those are keyed casings that will not mate with the Standard Housings. The battery connectors are "Anderson Power" "SB-50"'s, grey and black which mate with each other. Surprisingly, they are quite inexpensive! I ordered enough housings, contacts, bonded assemblies, and hardware to continue the project without cutting any wires. I also received the Raspberry Pi 3 that I am quite impressed with, along with a couple of nRF52832 boards that I wanted to connect to the Propeller, but I think the base can be completely controlled by the Raspberry Pi 3, we'll see. GPS, and distance sensors will be connected to the Propeller which in turn will communicate with the Pi over its GPIO port, I've used it for this purpose before so I know I have the code floating around someplace. The Pi can't do it all so the Propeller is going to be used for reading all the sensors I have planned. I wanted to use the propeller to communicate with the MCP using packet serial, but I cant find anything for packet serial in OBEX or on the forums, also it will be used to cut main battery power to the controlling Pi, incase of errors. The raspberry Pi apparently can communicate with the MCP directly through USB which is the fastest method so I will tinker with that for now. I will update this post in a few weeks when more parts come in. The project total so far, not including the power chair, is about $450-$500 so I am in it till the end now! That doesn't include anything that will be attached to the base as a functional component. Next month, January 2018, I will take on the Linear actuators I will use for the arm motions, 2" or 4" actuators should be all I need as long as I build the cam on the arm, wrist, and fingers correctly. In the mean time, I am working on the Python code that will run on the Pi. I am using a python lib called pygame so I can use a standard USB Joystick/Gamepad. Got it working in that respect and the code is fairly small and I am getting the values I need for the MCP controller. Using Wi-Fi and 2 Pi's I can control the base remotely over my local network, or directly with each other. One to stream video of a camera (attached to the base), the other to send the joystick controls and view the video being streamed. That way, my fiance can move it about the house and retrieve, do things, without waiting for someone to put her in her chair when no one is home. Slowly but surely it is truckin along! That is incredible; I can't wait to see how things progress. There is so little advances on wheelchairs because of no funding interest, so it's great to see this type of project building. A buddy of mine has a wheelchair and I help him in and out of a his van; I have wanted to build something for him to make it easier, but getting a spare chair for dev is harder than I thought it was going to be. This is the Frankenstein Moment! I have about 25Gb of video I have to go through that details the process. Now to make a few purchases of sensors to connect to the Propeller and Raspberry Pi. Still alot of work to do I'd like to connect 8 PING sensors around it facing about 30-45 degrees downward to detect objects and drop-offs around steps and wheelchair ramps. I bought the MCP263 for this project and the software on the screen is IonStudio by Ion Motion, the maker of the MCP263. The 3000A 30V interrupt was on the chair connected between both batteries. I learned that getting help with funding on a project for the handicapped were very limited because of the little roi. Billings has plenty of areas that do not have great curbs or super narrow sidewalk entrances in older areas. I was taking buddy into his wheelchair maintenance and got to talking with a lady who was lucky knowledgeable about getting help with funding a project. Getting him in and out is something of an obstacle, and I know technology has a very helpful answer for it. Right now there is a pulley-style setup that is as cumbersome as much as it sounds, from what I've been told; so a better solution is highly needed and wanted. Project update: I got Two Raspberry Pi 3B+'s and a Pi Zero W. One Pi 3B+ has a USB Game Controller working in Python to read the Joystick values, this Pi is connected to an official Display with case that will be the controller over Wi-Fi. I still need to send and receive the data between two Pi's. Not to mention I found out my Fiance is Pregnant that means I have 9 months to get all this together and documented, I'm still taking photos and videos but haven't gotten around to updating the first few posts yet. Congratulations to you and your fiance, sounds like your going to be keeping very busy now in the anticipation of the new arrival. I have been following your progress and hope to see some updates on your progression with this project. It is definitely progressing, here is another video update. It's about 18 minutes. I used a similar hall effect sensor in a bike project as a speedometer, and I covered it with Flex-seal and took it outside without any issues. You might be able to use that where possible to protect the electronics in this situation. Looks great Jorge. I imagine there has to be something online on connecting a Pi Zero to a Smart Pi Touch (super sweet by the way). I suppose you could use radio or wifi connection, and just then serial communication back and forth. Xbee would give you communication up to a good distance away, wifi would allow for internet access potential, for the good and bad. Glad to see that you are making progress. The new Laser Ping might be just the ticket for your close in range measurements when you are doing things like reaching for objects in a cupboard. As per the discussions in the LaserPing thread, you could run 4 pings, serially in a single Cog for Max efficiency and minimum cog usage. I've got some Python samples running on a Raspberry Pi Zero W that is connected to the MCP263. I'm currently using VNC to communicate with the Pi. I also installed the PropellerIDE on the Pi Zero so I can connect up the ultrasonic sensors to the Propeller, I will connect another Automotive Charge Adapter for the Propeller. Here is another Video of some further Progress, it looks messy but once its all wired and functioning I will mount everything onto a steel plate and shorten some wires. Also note the sample code does not exit cleanly from python and the motors continue to run, I had to start the code again and shut it down when the motors were stopped. The ultrasonic sensor code I have tested and working is in this post and some code is not used, this will be overhauled to read the 8 sensors in a round robin fashion so only one sensor is active at a time to prevent any interference. The new Laser Ping might be just the ticket for your close in range measurements when you are doing things like reaching for objects in a cupboard. As per the discussions in the LaserPing thread, you could run 4 pings, serially in a single Cog for Max efficiency and minimum cog usage. I'll check it out, but I wan't to get what I have fully functional before anything more is purchased. I imagine there has to be something online on connecting a Pi Zero to a Smart Pi Touch (super sweet by the way). I suppose you could use radio or wifi connection, and just then serial communication back and forth. Xbee would give you communication up to a good distance away, wifi would allow for internet access potential, for the good and bad. I'm in the process of relocating the motor controller to the back of the power base and shortening the wires. I'm getting rid of the wood base it is on to clean up the look and make room for attachments. I'm adding a few 74HC4076 IC's to get the ultrasonic sensors connected. The code for the propeller isn't finished yet but I have a sample in the "Propeller 1" sub forum as noted in my previous post. The multiplexers will be connected to the trig pins of the HC-SR04's. I only have SOICS so I am using Right Angle through hole pins staggered to place some jumper wires on, I'll post some photos/video in the next few days. I have the hall sensor circuits mounted on pcbs and need to pickup some small cases for them. I am going to try and setup some adjustment screws to adjust the positions of the sensors for the quadrature encoder. Positioning the magnets on the rims of the wheel is going to be challenging without a dividing/indexing head but maybe a simple printout will work fine. I have access to some older wheelchair too, so I am following with great interest. 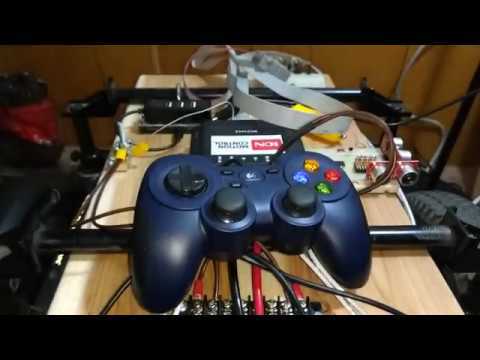 My current goal is to use the existing hardware and just propellerize the existing joystick, so avoiding the cost of new Motor drivers. I, initially, was interested in using the original controllers, but the signals from the hand controller are proprietary for each company. They use canbus... The motor controllers are over kill but there needs to be some sort of safety in the event of a motor stall. My motors are rated 1000 Watts max but a continuous rating of 250 watts which is about 10-15 amps at 24V, I think. I have noticed that any time someone posts any information about the encrypted canbus signals from anything mobility aid, it gets deleted or the entire website disappears That's why I decided on using a beefy motor controller... I don't have to worry about that. I sat down and drew up a draft of what I need to wire with the components I have, some are still on their way, this is my rough idea of how it will function (see attachment) NOTE: links point to the product pages on amazon, ionmc, and parallax. I've left out the fuses and motors and motor brakes for now. Does this all seem correct? You are a great man! Good luck with everything! Thanks everyone for all the comments, I read them all, just not always able to respond. I have another update! It's looking much better now but still a bit messy. I was in the middle of rewiring and thought it looked good enough for a new video update. This one is about 20 minutes. I now have the case planned out how I want it, it's currently cardboard to serve as a template so I can lay things out. I will be looking into 1/8th in. plastic, 1/16th in. steel, or maybe even fiberglass. I still may need re-layout everything to make all the electronics fit. And I am still waiting on a power resister for the protection circuit, the MCP263 already has TVS Diodes in it, so it simplifies the circuit, as noted by IonMotion in a recent forum post on their site. Do you think you could use aluminum instead of steel? Lighter but still sturdy and wouldn't melt if anything over-heated. Are you going to add a brown out detector for the Raspberry Pi? $600 for batteries!!! Holy battery cost Batman.. haha I can see why you are using these as long as possible. You could use a ADC to monitor each of the batteries and output that to your display easy enough with either the pi or the prop. There is some sample code on the parallax website for the prop. ADC MCP3204-B is a nice and easy to operate, would give you 4 channels. Only 5 years for chair support? wow, that isn't very long; should be longer term support since normally the use of a wheelchair is much longer than 5 years. Guess they have to be able to sell you a new one. Silver lining idea, once it's up and running, you could sell the whole thing as a plan/kit and get some of the costs while helping everyone. I have considered it but I am afraid that it might bend too easily and short the electronics if it does. No matter what I end up going with, I'll need to have it fabricated because I have no experience with any of those materials and that price will also play a role in my decision. I don't think I will ever get to a brown out condition on the Pi or Propeller. The batteries are wired for 24V and I have high/low alarms set for 25 and 22 volts, respectively, the 24V to 12V converter will still put out a constant 12V as long as the voltage never drops below about 14V. These MK batteries seem to be more expensive, these are 73Amps each, the original batteries for the chair were only 55 Amps each. A pair of the 55A batteries go for about $150. These MK's are 250-300 a piece not including any shipping/freight charges. Got the case made out of Polycarbonate and mounted the display so I can read it better. Now to place everything back onto it permanently. I'll post one last video when its all wired back up! I don't like how the company that made the case didn't make it accurately, none of the corners are 45 degree angles like I specified, If I have it done again I will be making sure that everything is accurate before bringing it home, especially after paying $140 for it! Wow, $140 and they did not make it right? I had the same thing happen with a company here in San Diego. The end result was, so sad, too bad. Anyway it looks great, much nicer than the wheelchair bot I cobbled together. More progress, I pulled an all nighter last night. Have 4 more short videos (3 to 6 min each) added to a playlist. Aside from cleaning some things up, the case no longer needs to be removed. I reconfigured the Anderson Power Connectors for the batteries and the motors, jabbered about the Propeller, and put everything back onto the chair. If you just want to see how it is after all that just skip to video 4 of 4 in the playlist. All 4 parts should be ready about 20 minutes after this post. The world needs more kind souls like you!